Petroglyphs from Val Camonica, Italy. Ancient astronaut proponents believe these pictures resemble modern astronauts. Intelligent extraterrestrial life visited the Earth in ancient times and affected human civilization. "Ancient astronauts" (or "ancient aliens") refers to the pseudoscientific idea that intelligent extraterrestrial beings visited Earth and made contact with humans in antiquity and prehistoric times. Proponents suggest that this contact influenced the development of modern cultures, technologies, and religions, and even human biology. A common position is that deities from most, if not all, religions are extraterrestrial in origin, and that advanced technologies brought to Earth by ancient astronauts were interpreted as evidence of divine status by early humans. The idea that ancient astronauts existed is not taken seriously by most academics, and has received no credible attention in peer reviewed studies. Furthermore, it is argued that some ancient astronaut proponents such as Erich von Däniken have fabricated evidence and distorted the facts of archeological research. Well-known proponents in the latter half of the 20th century who have written numerous books or appear regularly in mass media include von Däniken, Zecharia Sitchin, Robert K. G. Temple, Giorgio A. Tsoukalos and David Hatcher Childress. Ancient astronauts proponents suggest that aliens came to Earth long ago, citing artifacts such as this ancient Mesopotamian cylinder seal. Proponents of the ancient astronaut hypothesis often maintain that humans are either descendants or creations of extraterrestrial intelligence (ETI) who landed on Earth thousands of years ago. An associated idea is that humans evolved independently, but that much of human knowledge, religion, and culture came from extraterrestrial visitors in ancient times, in that ancient astronauts acted as a "mother culture". Some ancient astronaut proponents also believe that travelers from outer space, referred to as "astronauts" (or "spacemen") built many of the structures on Earth (such as Egyptian pyramids and the Moai stone heads of Easter Island) or aided humans in building them. Various terms are used to reference claims about ancient astronauts, such as ancient aliens, ancient ufonauts, ancient space pilots, paleocontact, astronaut- or alien gods, or paleo- or Bible-SETI (search for extraterrestrial intelligence). Proponents argue that the evidence for ancient astronauts comes from documentary gaps in historical and archaeological records, and they also maintain that absent or incomplete explanations of historical or archaeological data point to the existence of ancient astronauts. The evidence is argued to include archaeological artifacts that they deem anachronistic, or beyond the accepted technical capabilities of the historical cultures with which they are associated. These are sometimes referred to as "out-of-place artifacts"; and include artwork and legends which are interpreted in a modern sense as depicting extraterrestrial contact or technologies. Scholars have responded that gaps in contemporary knowledge are not evidence of the existence of ancient astronauts, and that advocates have not provided any convincing anecdotal or physical evidence of an artifact that might conceivably be the product of ETI contact. According to astrophysicist Carl Sagan, "In the long litany of 'ancient astronaut' pop archaeology, the cases of apparent interest have perfectly reasonable alternative explanations, or have been misreported, or are simple prevarications, hoaxes and distortions". Paleocontact or "ancient astronaut" narratives first appeared in the early science fiction of the late 19th to early 20th century. 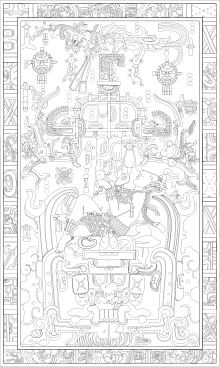 The idea was proposed in earnest by Harold T. Wilkins in 1954; it received some consideration as a serious hypothesis during the 1960s. Critics of the theory emerged throughout the 1970s, discrediting Von Daniken's theory[clarification needed]. Ufologists separated the idea from the UFO controversy. By the early 1980s little remaining support of the theory could be found. A Dogū figurine from Japan (dated 1000–400 BCE). 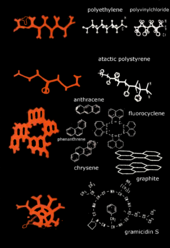 Ancient astronaut proponents suggest that these may represent extraterrestrial visitors. Votive relief of the winged priest of Dudu on display at the Louvre Museum, France. In Intelligent Life in the Universe (1966) astrophysicists I. S. Shklovski and Carl Sagan devote a chapter to the argument that scientists and historians should seriously consider the possibility that extraterrestrial contact occurred during recorded history; however, Shklovski and Sagan stressed that these ideas were speculative and unproven. Shklovski and Sagan argued that sub-lightspeed interstellar travel by extraterrestrial life was a certainty when considering technologies that were established or feasible in the late 1960s; that repeated instances of extraterrestrial visitation to Earth were plausible; and that pre-scientific narratives can offer a potentially reliable means of describing contact with aliens. Sagan illustrates this hypothesis by citing the 1786 expedition of French explorer Jean-François de Galaup, comte de La Pérouse, which made the earliest first contact between European and Tlingit cultures. The contact story was preserved as an oral tradition by the preliterate Tlingit. Over a century after its occurrence it was then recorded by anthropologist George T. Emmons. Although it is framed in a Tlingit cultural and spiritual paradigm, the story remained an accurate telling of the 1786 encounter. According to Sagan, this proved how "under certain circumstances, a brief contact with an alien civilization will be recorded in a re-constructible manner. He further states that the reconstruction will be greatly aided if 1) the account is committed to written record soon after the event; 2) a major change is effected in the contacted society; and 3) no attempt is made by the contacting civilization to disguise its exogenous nature." In his 1979 book Broca's Brain, Sagan suggested that he and Shklovski might have inspired the wave of 1970s ancient astronaut books, expressing disapproval of "von Däniken and other uncritical writers" who seemingly built on these ideas not as guarded speculations but as "valid evidence of extraterrestrial contact." Sagan argued that while many legends, artifacts, and purported out-of-place artifacts were cited in support of ancient astronaut hypotheses, "very few require more than passing mention" and could be easily explained with more conventional hypotheses. Sagan also reiterated his earlier conclusion that extraterrestrial visits to Earth were possible but unproven, and improbable. According to Erich von Däniken, the Sarcophagus lid of Pacal the Great represents an "ancient astronaut" ascending to the stars in his spaceship. Von Däniken writes that ancient art and iconography throughout the world illustrates air and space vehicles, non-human but intelligent creatures, ancient astronauts, and artifacts of an anachronistically advanced technology. Von Däniken also states that geographically separated historical cultures share artistic themes, which he argues imply a common origin. One such example is von Däniken's interpretation of the sarcophagus lid recovered from the tomb of the Classic-era Maya ruler of Palenque, Pacal the Great. Von Däniken writes that the design represented a seated astronaut. The iconography and accompanying Maya text, however, identifies it as a portrait of the ruler himself with the World Tree of Maya mythology. The origins of many religions are interpreted by von Däniken as reactions to encounters with an alien race. According to his view, humans considered the technology of the aliens to be supernatural and the aliens themselves to be gods. Von Däniken states that the oral and written traditions of most religions contain references to alien visitors in the way of descriptions of stars and vehicular objects travelling through air and space. One such is Ezekiel's revelation in the Old Testament, which Däniken interprets as a detailed description of a landing spacecraft (The Spaceships of Ezekiel). Von Däniken's hypotheses became popularized in the U.S. after the NBC-TV documentary In Search Of Ancient Astronauts hosted by Rod Serling and the film Chariots of the Gods. Critics argue that von Däniken misrepresented data, that many of his claims were unfounded, and that none of his core claims have been validated. In particular the Christian creationist community is highly critical of many of von Däniken's work. Young Earth creationist author Clifford A. Wilson published Crash Go the Chariots in 1972 in which he attempted to discredit all the claims made in Chariots of the Gods. Zecharia Sitchin's series The Earth Chronicles, beginning with The 12th Planet, revolves around Sitchin's unique interpretation of ancient Sumerian and Middle Eastern texts, megalithic sites, and artifacts from around the world. 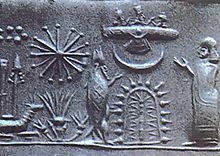 He hypothesizes that the gods of old Mesopotamia were astronauts from the planet "Nibiru", which Sitchin states the Sumerians believed to be a remote "12th planet" (counting the Sun, Moon, and Pluto as planets) associated with the god Marduk. According to Sitchin, Nibiru continues to orbit our sun on a 3,600-year elongated orbit. Modern astronomy has found no evidence to support Sitchin's ideas. Sitchin argues that there are Sumerian texts which tell the story that 50 Anunnaki, inhabitants of a planet named Nibiru, came to Earth approximately 400,000 years ago with the intent of mining raw materials, especially gold, for transport back to Nibiru. With their small numbers they soon grew tired of the task and set out to genetically engineer laborers to work the mines. After much trial and error they eventually created Homo sapiens sapiens: the "Adapa" (model man) or Adam of later mythology. Sitchin contended the Anunnaki were active in human affairs until their culture was destroyed by global catastrophes caused by the abrupt end of the last ice age some 12,000 years ago. Seeing that humans survived and all they had built was destroyed, the Anunnaki left Earth after giving humans the opportunity and means to govern themselves. Sitchin's work has not received mainstream scholarly support and has been roundly criticized by professionals that have reviewed his hypotheses. Semitic languages scholar Michael S. Heiser says that many of Sitchin's translations of Sumerian and Mesopotamian words are not consistent with Mesopotamian cuneiform bilingual dictionaries, produced by ancient Akkadian scribes. Alan F. Alford, author of Gods of the New Millennium (1996), was an adherent of the ancient astronaut hypothesis. Much of his work draws on Sitchin's hypotheses. 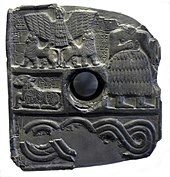 However, he now finds fault with Sitchin's hypothesis after deeper analysis, stating that: "I am now firmly of the opinion that these gods personified the falling sky; in other words, the descent of the gods was a poetic rendition of the cataclysm myth which stood at the heart of ancient Near Eastern religions." Robert K. G. Temple's 1976 book, The Sirius Mystery argues that the Dogon people of northwestern Mali preserved an account of extraterrestrial visitation from around 5,000 years ago. He quotes various lines of evidence, including advanced astronomical knowledge inherited by the tribe, descriptions, and comparative belief systems with ancient civilizations such as ancient Egypt and Sumer. His work draws heavily on the studies of cultural anthropologists Marcel Griaule and Germaine Dieterlen. Various new religious movements including some branches of theosophy, Scientology, Raëlism, and Heaven's Gate believe in ancient and present-day contact with extraterrestrial intelligence. Many of these faiths see both ancient scriptures and recent revelations as connected with the action of aliens from other planetary systems. Psychologists have found that UFO religions have similarities which suggest that members of these groups consciously or subliminally associate enchantment with the memes of science fiction. 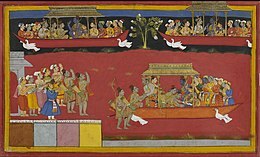 Rama being welcomed upon his return to Ayodhya in king Ravana's flying chariot Pushpaka Vimana. Among scientists, the consensus is that the ancient astronaut hypothesis is not per se wrong, but unnecessary. The "mysteries" cited as evidence for the hypothesis can be explained without having to invoke ancient astronauts; proponents look for mysteries where none exist. Since ancient astronauts are unnecessary, Occam's razor should be applied and the hypothesis rejected according to the scientific consensus. Proponents cite ancient mythologies to support their viewpoints based on the idea that ancient creation myths of gods who descend from the heavens to Earth to create or instruct humanity are representations of alien visitors, whose superior technology accounts for their perception as gods. Proponents draw an analogy to occurrences in modern time when isolated cultures are exposed to Western technology, such as when, in the early 20th century, "cargo cults" were discovered in the South Pacific: cultures who believed various Western ships and their cargo to be sent from the gods as fulfillment of prophecies concerning their return. The scholar of Christ mythicism Dorothy Murdock criticized ancient astronauts theories, asserting that they "may be prompted by the same type of motivation that produced the Bible, a chronicle largely consisting of the plagiarized myths of other cultures" refashioned as historical facts concerning purported historical characters, and may be driven by the attempt to validate Biblical mythology as historical under a new pseudo-scientific interpretation. Named Pushpak, wrought by hands divine. In fair Ayodhyá's royal town. The wondrous car from earth arose. Bore through the clouds its freight of kings. Erich von Däniken discusses the Ramayana and the vimanas in Chapter 6 of Chariots of the Gods? suggesting that they were "space vehicles". To support his hypothesis, he offers a quotation which he says is from an 1889 translation of the Mahabharata by C. Roy: "Bhima flew with his Vimana on an enormous ray which was as brilliant as the sun and made a noise like the thunder of a storm". The Nephilim were on the earth in those days—and also afterward—when the sons of God went to the daughters of humans and had children by them. Many Christians consider these groups to be the different families of Adam and Eve's children. Another interpretation is that the Nephilim are the children of the "sons of God" and "daughters of humans", although scholars are uncertain. The King James Version translates "Nephilim" as "giants" (or Gibborim). Ancient Astronaut theorists argue that Adam and Eve ate of the forbidden fruit in order "to be godlike", and this was the first step in human evolution. The first part of the apocryphal Book of Enoch expands and interprets Genesis 6:1: that the "sons of God" were a group of 200 "angels" called "Watchers", who descended to Earth to breed with humans. Their offspring are the Nephilim, "giants" who "consumed all the acquisitions of men". When humans could no longer sustain the Nephilim, they turned against humanity. The Watchers also instructed humans in metallurgy and metalworking, cosmetics, sorcery, astrology, astronomy, and meteorology. God then ordered the Watchers to be imprisoned in the ground, and created the Great Flood (or the numerous Deluge myths) to rid Earth of the Nephilim and of the humans given knowledge by the Watchers. To ensure humanity's survival, Noah is forewarned of the oncoming destruction. Because they disobeyed God, the book describes the Watchers as "fallen angels". Some ancient astronaut proponents argue that this story is a historical account of extraterrestrials visiting Earth, called Watchers because their mission was to observe humanity. Some of the extraterrestrials disobeyed orders; they made contact with humans, cross-bred with human females, and shared knowledge with them. The Nephilim were thus half-human-half-extraterrestrial hybrids. Chuck Missler and Mark Eastman argue that modern UFOs carry the fallen angels, or offspring of fallen angels, and that "Noah's genealogy was not tarnished by the intrusion of fallen angels. It seems that this adulteration of the human gene pool was a major problem on the planet earth". Von Däniken also suggests that the two angels who visited Lot in Genesis 19 were ancient astronauts, who used atomic weapons to destroy the city of Sodom. Marc Dem reinterprets the Book of Genesis by writing that humanity started on another planet and that the God of the Bible is an extraterrestrial. 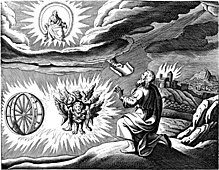 In the Old Testament, Chapter 1 of the Book of Ezekiel recounts a vision in which Ezekiel sees "an immense cloud" that contains fire and emits lightning and "brilliant light". It continues: "The center of the fire looked like glowing metal, and in the fire was what looked like four living creatures". These creatures are described as winged and humanoid, they "sped back and forth like flashes of lightning" and "fire moved back and forth among the creatures". The passage goes on to describe four shiny objects, each appearing "like a wheel intersecting a wheel". These objects could fly and they moved with the creatures: "When the living creatures moved, the wheels beside them moved; and when the living creatures rose from the ground, the wheels also rose". In Chapter 4 of Chariots of the Gods?, entitled "Was God an Astronaut? ", von Däniken suggests that Ezekiel had seen a spaceship or spaceships; this hypothesis had been put forward by Morris Jessup in 1956 and by Arthur W. Orton in 1961. A detailed version of this hypothesis was described by Josef F. Blumrich in his book The Spaceships of Ezekiel (1974). The characteristics of the Ark of the Covenant and the Urim and Thummim have been said to suggest high technology, perhaps from alien origins. Robert Dione and Paul Misraki published books in the 1960s describing the events in the Bible as caused by alien technology. Barry Downing, a Presbyterian minister, wrote a book in 1968 arguing that Jesus was an extraterrestrial, citing John 8:23 and other biblical verses as evidence. Some ancient astronaut proponents such as Von Däniken and Barry Downing believe that the concept of hell in the Bible could be a real description of the planet Venus brought to Earth by extraterrestrials showing photos of the hot surface on Venus to humans. Proponents of the hypothesis state that 'God' and 'Satan' were aliens that disagreed on whether or not human beings should be allowed the information that is offered by the tree of knowledge. David Childress, a leading proponent of ancient astronaut creation hypothesis, compares this story to the Greek tale of Prometheus, who gave mankind the knowledge of fire. Ancient Astronaut theorists believe the biblical concept of Satan is based on a misunderstood visit by extraterrestrials. Erich von Däniken posited that the descendants of extraterrestrials had children with hominids, and this was referred to in the Bible as the "Original sin." Von Däniken believes that the biblical great flood was punishment after an extraterrestrial 'God' discovered that earthbound, fallen angels were mating with ape-like early humans. Childress and others have written that the passage in the Book of Invasions describing the arrival of the Tuatha Dé Danann in Ireland, records "the arrival of aliens in spacecraft with cloaking devices" at Slieve Anierin. The key text states “so that they were the Tuatha De Danand who came to Ireland. In this wise they came, in dark clouds. They landed on the mountains of Conmaicne Rein in Connacht and they brought a darkness over the sun for three days and three nights". 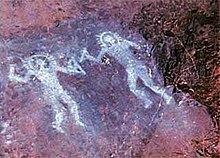 Ancient astronaut theorists believe Hopi cave drawings of Kachinas (spirit beings) found in the desert link the origins of Hopi and Zuni tribes with "star people". They point to similar etchings elsewhere as evidence that extraterrestrials visited many different ancient civilizations. Other artistic support for the ancient astronaut hypothesis has been sought in Palaeolithic cave paintings. 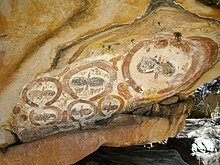 Wondjina in Australia and in the Rock Drawings in Valcamonica, in Italy (seen above) are said to bear a resemblance to present day astronauts. Supporters of the ancient astronaut hypothesis sometimes argue that similarities such as dome shaped heads, interpreted as beings wearing space helmets, prove that early man was visited by an extraterrestrial race. More support of this hypothesis draws upon what are said to be representations of flying saucers in medieval and renaissance art. The ancient Nazca Lines are hundreds of huge ground drawings etched into the high desert of southern Peru. Some are stylized animals and humanoid figures, while others are merely straight lines hundreds of meters long. As the figures were made to be seen from a great height, they have been linked with the ancient astronaut hypothesis. In the 1970s, the pseudohistorical writer Erich von Däniken popularized a notion that the Nazca lines and figures could have been made "according to instructions from aircraft" and that the longer and wider lines might be runways for spacecraft. According to archaeologist Kenneth Feder, Von Däniken's extraterrestrial interpretation is not supported by any evidence. Feder wrote that "the lines are interpreted by archaeologists as ceremonial pathways of the ancient Nazca people; they were used precisely in this way in the fairly recent past." Joe Nickell of the University of Kentucky was able to re-create one of the figures using only wooden stakes and string. Proponents of the ancient astronauts idea say some artifacts discovered in Egypt (the Saqqara Bird) and Colombia-Ecuador are similar to modern planes and gliders. These artifacts have been interpreted by mainstream archaeologists, however, as stylized representations of birds and insects. Proposed evidence for ancient astronauts includes the existence of ancient monuments and megalithic ruins such as the Giza pyramids of Egypt, Machu Picchu in Peru, or Baalbek in Lebanon, the Moai of Easter Island and Stonehenge of England. Supporters say that these stone structures could not have been built with the technical abilities and tools of the people of the time and further argue that many could not be duplicated even today. They suggest that the large size of the building stones, the precision with which they were laid, and the distances many were transported leaves the question open as to who constructed these sites. These ideas are categorically rejected by mainstream archeology. Some mainstream archeologists have participated in experiments to move large megaliths. These experiments have succeeded in moving megaliths up to at least 40 tons, and they have speculated that with a larger workforce larger megaliths could be towed with the use of known ancient technology. Such allegations are not unique in history, however, as similar reasoning lay behind the wonder of the Cyclopean masonry walling at Mycenaean cities in the eyes of Greeks of the following "Greek Dark Ages", who believed that the giant Cyclops had built the walls. 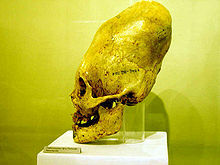 A physiologically manipulated Paracas skull (housed at the Museo Regional de Ica in Peru). A number of ancient cultures, such as the Ancient Egyptians and some Native Americans, artificially lengthened the skulls of their children. Some ancient astronaut proponents propose that this was done to emulate extraterrestrial visitors, whom they saw as gods. Among the ancient rulers depicted with elongated skulls are pharaoh Akhenaten and Nefertiti. It has been pointed out that the Grey aliens, as described by many alien abductees, have similarly shaped heads. In the program Ancient Aliens it was suggested that the owners of the biggest of the lengthened skulls may be human-extraterrestrial hybrids. Ancient astronauts have been addressed frequently in science fiction and horror fiction in many different media. In a 2004 article in Skeptic magazine, Jason Colavito writes that von Däniken borrowed many of the book's concepts from Le Matin des Magiciens (Morning of the Magicians), that this book in turn was heavily influenced by the Cthulhu Mythos, and that the core of the ancient astronaut hypothesis originates in H. P. Lovecraft's works "The Call of Cthulhu" and At the Mountains of Madness. Jason Colavito later expanded on this idea in his book The Cult of Alien Gods: H. P. Lovecraft and Extraterrestrial Pop Culture. Ancient Aliens is a television series that features the main proponents of the ancient astronaut hypothesis, such as Giorgio A. Tsoukalos, David Childress, Erich von Däniken, Steven M. Greer, and Nick Pope. 1989: Salvador Freixedo, (book, La Amenaza Extraterrestre — Spanish: The Alien Threat). Wikimedia Commons has media related to UFO. ^ Lieb, Michael (1998). Children of Ezekiel: Aliens, Ufos, the Crisis of Race, and the Advent of End Time. Duke University Press. p. 250. ISBN 0-8223-2268-4. ^ Cithara. St. Bonaventure University. 1961. p. 12. ^ Olien, Michael D. (1978). "Did Ancient Astronauts Bring Civilization?". The Human Myth: An Introduction to Anthropology. USA: Harper & Row. pp. 236–241, 245, 255. ISBN 0-06-044918-7. ^ Linedecker, Cliff (3 April 2001). "Ancient Astronauts Colonized Earth 10,000 Years Ago". Weekly World News. pp. 18–19, 35. ISSN 0199-574X. ^ Sagan, Carl (2011) . Broca's Brain. Random House Publishing Group. pp. 65–68, 79. ISBN 0-394-50169-1. ^ Shklovsky, Iosif S.; Sagan, Carl (1966). "33: The Possible Consequences of Direct Contact". Intelligent Life in the Universe. Translated by Fern, Paula. San Francisco, California: Holden-Day. pp. 448–464. ^ Sagan, Carl (1979). "White Dwarfs and Little Green Men". Broca's Brain: Reflections on the Romance of Science. Ballantine Books. pp. 77–94. ISBN 0-345-33689-5. ^ Shklovskiĭ, I. S. (1998). Intelligent life in the universe. Boca Raton, Fla: Emerson-Adams Press. ISBN 9781892803023. ^ a b Carroll, Robert T (1994–2009). "The Skeptic's Dictionary". Zecharia Sitchin and The Earth Chronicles. John Wiley & Sons. Retrieved 5 January 2013. ^ Kilgannon, Corey (8 January 2010). "Origin of the Species, From an Alien View". The New York Times. Retrieved 29 October 2010. Mr. Sitchin was called silly before—by scientists, historians and archaeologists who dismiss his hypotheses as pseudoscience and fault their underpinnings—his translations of ancient texts and his understanding of physics. ^ "Open Letter to Zecharia Sitchin". stichiniswrong.com. ^ "Zechariah Sitchin" Archived April 3, 2013, at the Wayback Machine, Mark Pilkington, Fortean Times, August 2003. ^ "Ancient Astronauts". Eridu.co.uk. Archived from the original on 17 July 2011. Retrieved 18 June 2011. ^ van Beek, Walter E. A. (1991). "Dogon Restudied: A Field Evaluation of the Work of Marcel Griaule". Current Anthropology. 32: 139–167. doi:10.1086/203932. ^ Partridge, C.H. (2003). UFO religions. Routledge. ISBN 978-0-415-26324-5. ^ Murdock, Dorothy Milne (6 January 2014). "Who are the Anunnaki?". Truth Be Known. ^ a b "Rámáyan of Válmíki, translated by Ralph T. H. Griffith". Sacred Texts. Retrieved 11 March 2014. ^ von Däniken, Erich; Chariots of the Gods? ; "Chapter 6: Ancient Imagination and Legends or Ancient Facts? "; 1968. ^ Vimanas; Main; accessed . ^ James Orr says "it is not easy to be certain of the interpretation of this strange passage." "Nephilim," The International Standard Bible Encyclopedia, James Orr, ed., (Chicago: Howard-Severance, 1930), Vol. IV, p. 2133. ^ "Book of Enoch (English and Swedish translations)". Enoksbok.se. Retrieved 11 March 2014. ^ Missler, Chuck, and Mark Eastman, Alien Encounters: The Secret Behind the UFO Phenomenon (Coeur d'Alene, ID: Koinonia House, 1997), 207. ^ von Däniken, 37. Le Poer Trench had previously speculated that a space vehicle had used nuclear weapons to destroy Sodom; Brinsley Le Poer Trench, The Sky People (New York: Award Books, 1970; copyright 1960, London) 64-5. ^ von Daniken, 38-9. Morris K. Jessup, UFO and the Bible (New York: Citadel Press, 1956) 56-59. ^ Orton, Arthur W. (March 1961). The Four-Faced Visitors of Ezekiel. Analog Science Fact & Fiction. p. 99 – via e-text at Project Gutenberg. ^ Josef F. Blumrich: The Spaceships of Ezekiel, Corgi Books, 1974. ^ "AncientDimensions Mysteries: De-Coded: The Ark Of The Covenant". Farshores.org. Archived from the original on 26 July 2011. Retrieved 18 June 2011. ^ "Hell is on the planet Venus" Weekly World News Aug 31, 1993. Books.google.com. 31 August 1993. Retrieved 18 June 2011. ^ "Ancient Aliens and the Creation of Man". Ancient Aliens. 24 November 2011. 27:20 minutes in. History Channel. ^ Colavito 2015, pp. 94-95. ^ "UFO Evidence". Etcontact.net. Retrieved 11 March 2014. ^ "Art and UFO – Part 5". Sprezzatura.it. 23 November 2002. Archived from the original on 22 July 2011. Retrieved 18 June 2011. ^ "The Mysterious Nazca Lines". Onagocag.com. 7 August 1982. Archived from the original on 15 July 2011. Retrieved 18 June 2011. ^ "Strange Artifacts, Ancient Flying Machines". World Mysteries. 17 December 1903. Archived from the original on 14 June 2011. Retrieved 18 June 2011. ^ "NOVA | Transcripts | Secrets of Lost Empires | Stonehenge". PBS. 11 February 1997. Retrieved 18 June 2011. ^ "NOVA Online | Mysteries of the Nile | August 27, 1999: The Third Attempt". Pbs.org. 27 August 1999. Retrieved 18 June 2011. ^ History Channel "Mega Movers: Ancient Mystery Moves"
^ a b c Kevin Burns (executive producer) (2011). Ancient Aliens, Series 3, Episode 8: Aliens and Lost Worlds (motion picture). A+E Networks. ^ Colavito, Jason (2004). "Charioteer of the Gods". Skeptic. Vol. 10 no. 4. ^ "Ancient Aliens". History.com. 14 June 2011. Archived from the original on 4 July 2011. Retrieved 18 June 2011. ^ "Lhote, Henri (1903–1991)". Daviddarling.info. 1 February 2007. Retrieved 18 June 2011. ^ Cairns-Smith, A. G. (1975). "A case for an alien ancestry". Proceedings of the Royal Society B. 189: 249–74. Bibcode:1975RSPSB.189..249C. doi:10.1098/rspb.1975.0056. ^ "A Case for an Alien Ancestry". Bibcode:1975RSPSB.189..249C. doi:10.1098/rspb.1975.0056. ^ Mark, Joshua J. "Enuma Elish – The Babylonian Epic of Creation". Ancient History Encyclopedia. Retrieved 1 December 2013. Charroux, Robert (1974). Masters of the world. Berkley Pub. Corp. ASIN B0006WIE1O. Colavito, Jason (2005). The Cult of Alien Gods: H. P. Lovecraft and Extraterrestrial Pop Culture. Prometheus Books. ISBN 1-59102-352-1. Grünschloß, Andreas (June 2006). ""Ancient Astronaut" Narrations: A Popular Discourse on Our Religious Past" (PDF). Marburg Journal of Religion. 11 (1). ISSN 1612-2941. Raël (1974). The Message Given by Extra-terrestrials. Nova Dist. ISBN 2-940252-20-3. Sitchin, Zecharia (1999). The 12th Planet (The Earth Chronicles, Book 1). Avon. ISBN 0-380-39362-X. Colavito, Jason (2015). Foundations of Atlantis, Ancient Astronauts and Other Alternative Pasts: 148 Documents Cited by Writers of Fringe History, Translated with Annotations. McFarland. ISBN 1476619409. "'Fringe' or 'cult' archaeology examined by professional archaeologist Keith Fitzpatrick-Matthews". Archived from the original on 14 December 2007. Retrieved 4 February 2007. Dunning, Brian. "Skeptoid #449: Ancient Astronauts". Skeptoid.